Turn out a British bicycle second to none. If you remove the words “British bicycle” in the last line this stands as a fundamental truism. 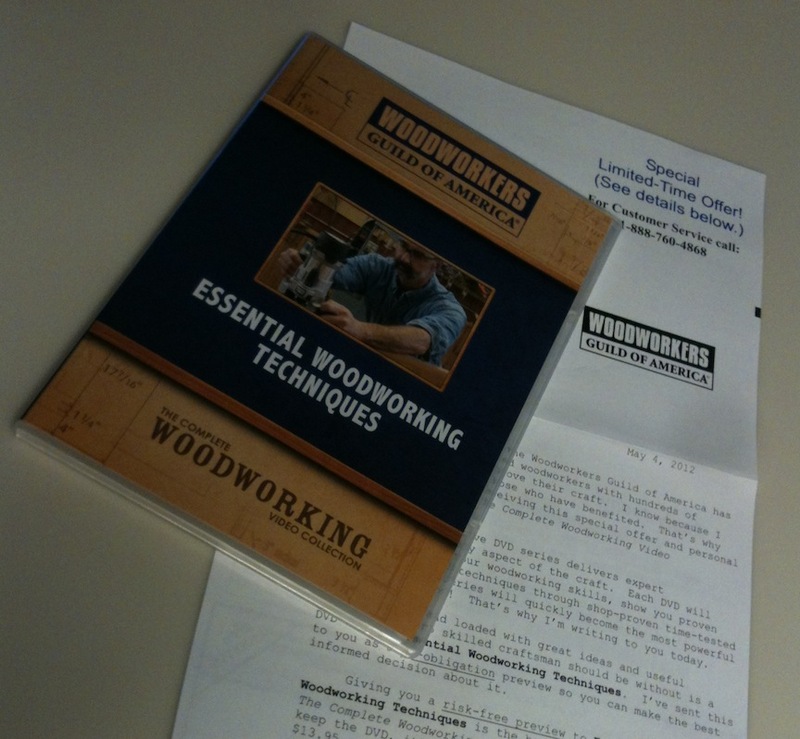 I got a woodworking DVD in the mail today. That’s not really that surprising in and of itself; I got 7 of them last week (the Paul Sellers set). Here is what is weird, and unappreciated. We all get plenty of junk mail. Generally it goes right in the recycle bin. The DVD I got is from the “Woodworker’s Guild of America”. I am not a member and I certainly didn’t order or request this. What really bugs me is that this isn’t a free DVD, it is sent “on approval”. If I like it I’m to pay them $13.95, if I don’t like it I’m supposed to send it back. I’m sure if I’d tossed this into the trash I would get a bill dunning me for the cost of the DVD. And if I didn’t pay for it I’m sure they would send it to a collections agency. Is that even legal? In case you’re wondering, I’m mailing the DVD back right now. Out of curiosity I watched the first 10 minutes of it. It’s very basic power tool woodworking using plywood. I have absolutely nothing against power tools or plywood, it’s just not interesting to me. It’s also at such a fundamental level that I would think that anyone who has read a few woodworking magazines would be bored by it. Saturday my son and I decided to carve a couple of spoons. Why spoons? That’s a great question. I recently got the book and DVD set by Paul Sellers called “Working Wood”. It’s not an inexpensive kit, about $150 depending on where you get it. On the other hand, it includes a book and 7 DVDs, so (I reasoned) if the content was good it might be worthwhile. I’ve watched my share of “how-to” videos over the years, and I’m not going to review this set until I’ve watched all of the DVDs and read all of the book, but I can say that it is certainly the slickest production job I’ve ever seen in the genere. Take a gander at this bit on making a stool and you’ll see what I mean. I want to live in a castle. But back to the point of the post. Why a spoon? 2. 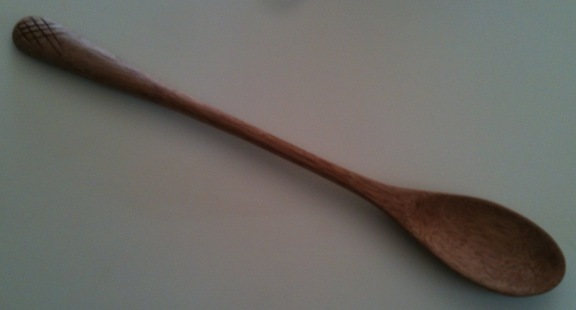 The first DVD starts with a wooden spatula and spoon as the beginning projects. I ruined the first two attempts, just going to fast. It’s been a while since I’ve had shop time and it takes me a while to get my focus. Nothing major. On one I carved the bowl of the spoon to deep, and on the other… Well I carved that one too deep too. But there were extenuating circumstances, the real problem was that I accidentally split off a piece when chiseling out the profile. I used a scrap of wood that I believe is Mahogany, I picked it up from a scrap bin at the lumberyard. 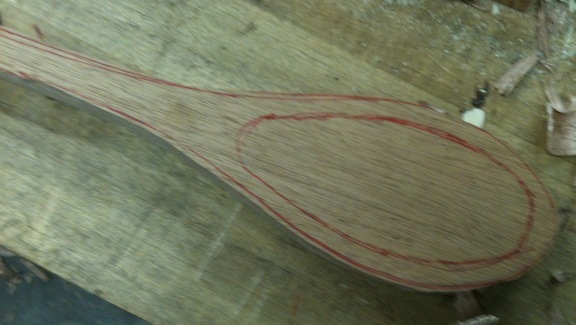 I traced around my template in red pen and was ready to make a 3rd piece of kindling. This is about 3/4″+ thick, I’d rather have something a little thicker next time so I can make a deeper bowl and curved handle. One of the great lessons in this exercise is using stop cuts and a chisel. 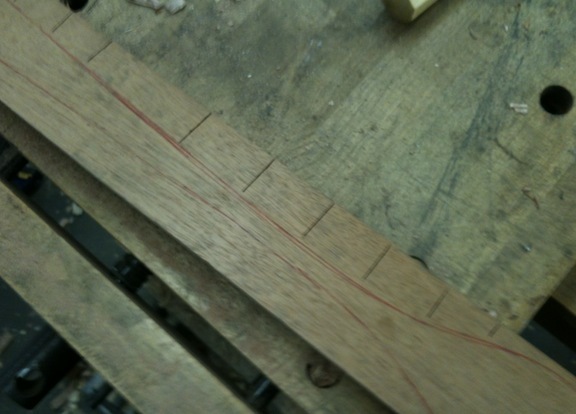 The entire profile was done with a handfull of stop cuts and a 1″ chisel. The saw cuts stop maybe 1/8″ above the layout line. Then I used a chisel to split off the majority of the waste, and then pare down to the line. 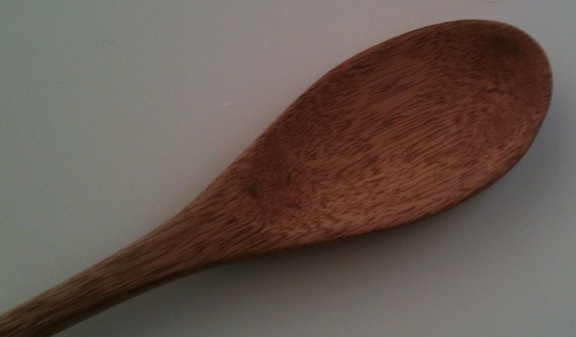 On outside curves – like around the front of the spoon bowl – I used the chisel bevel-up. Paul had some good tips for doing this in the video. On the concave area along the handle I used the chisel bevel-down. Split off the bulk of the material, then pare to the line. This process of profiling the shape took no time at all. It was faster than sawing it with a coping saw, and instead of a rough, sawn edge you have a slick planed surface. I sketched in the bowl shape and used a gouge to rough it out. I need a bigger gouge next time. I scraped and then sanded the inside of the bowl smooth. I tried my spokeshave for shaping the handle, but it wouldn’t cut well. I’m not sure what the problem was — it worked great on pine and cherry. So I used the chisel to shape the bottom of the bowl, and the handle. The handle was sanded with 120 and 220, then I gave it a coat of pure linseed oil and wax (no driers). I’ll let it dry until I’m sure it well cured and then wash it, and then put it to work in the kitchen. I carved a small design in the handle to balance things out. Overall, it’s ok. Reasonably graceful, it feels nice in my hand. It was a great learning experience. I’m going to make a few more for fun. The next project in Seller’s book is a 3-legged milking stool with a carved (windsor-ish) seat. A few more pictures from May Day at Blue Ox Mill. This is an interesting place, besides being a working mill that produces decorative trim it’s also an alternate high school where the kids learn blacksmithing, wood turning, printing and other crafts. What a phenomenally cool idea. 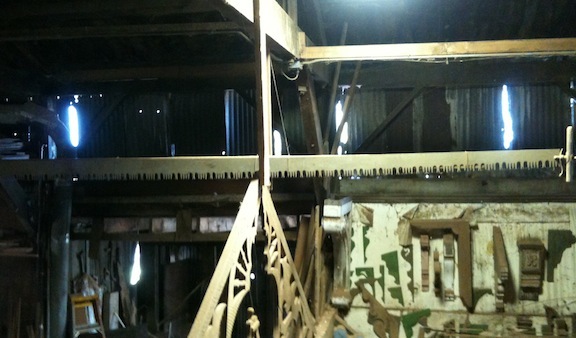 The whole place is part museum and part working shop. 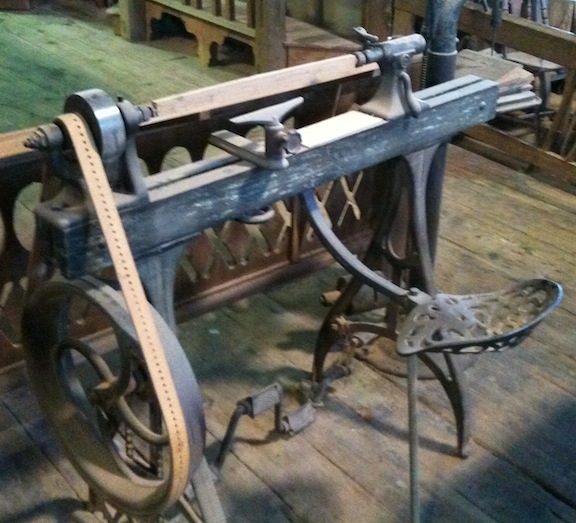 They have a bunch of old human powered woodworking machines. 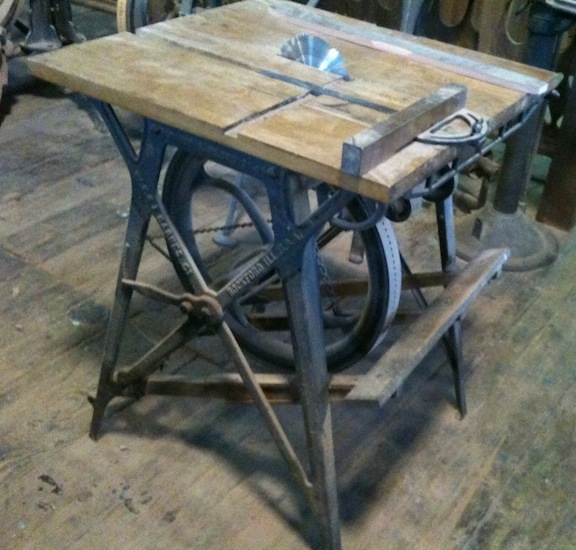 This table saw scares me, I suspect it’s pre-OSHA…but it’s cool as heck. Is there a SawStop retrofit for these? I like the pedal-powered lathe. I think this idea still has merit, you could burn calories while turning out parts. It could be a great crossover business for Nordic Track. 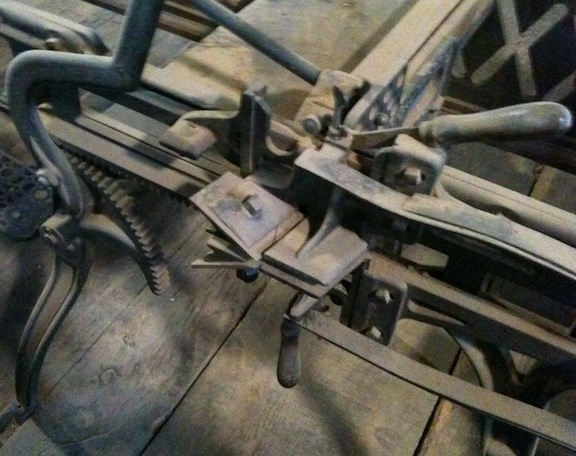 There are three pedals, and the seat can be adjusted from side-to-side so you can work on longer parts. The big cast iron wheel looks like it would probably have a nice flywheel effect. Hand Tenoner. 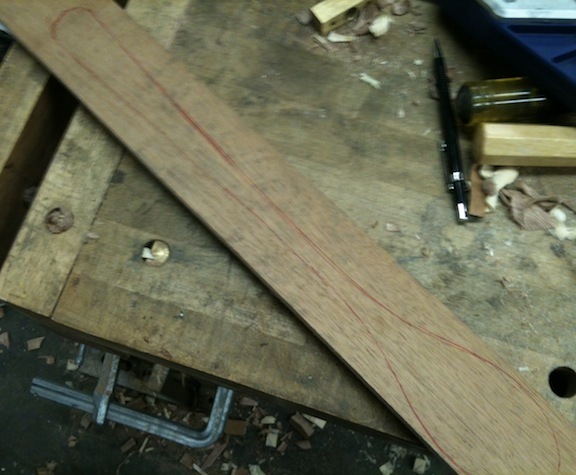 It cuts a healthy shaving off one face to form one tenon cheek. It’s look like it could be made into a Nautilus-style exercise machine. 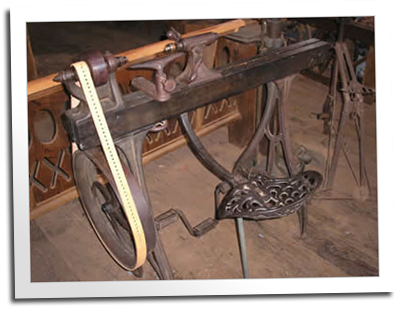 This 20 foot long two man crosscut saw is called the “Misery Whip”. The placard said it would cut through a tree in 35 strokes. I wonder why it’s called that? 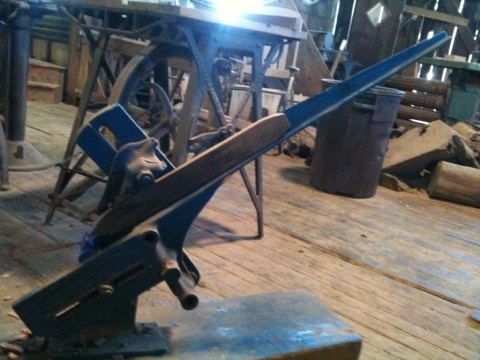 There was a group of Blue Ox students working in the turning shop making pens and bottle stoppers for sale. We bought the Tulip wood pen this guy is working on. I think it’s great that there are alternatives for kid these days. They still had shop class at the public high school when I was a kid, but I was at the military school instead. 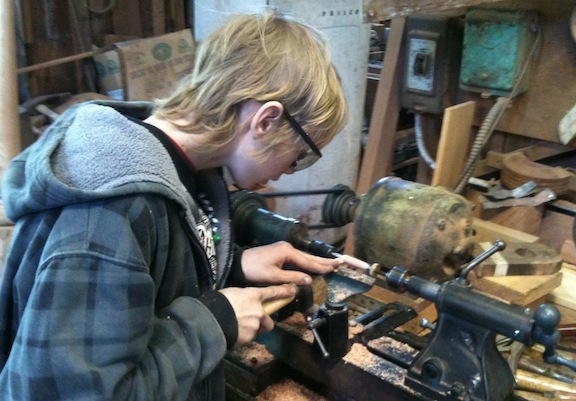 This got me thinking, I wonder if I could do a hand tool woodworking class at my son’s school? Hi, my name is Joe, and I’m powerless over hand tools. The first step is to admit you have a problem, right? When I got home from work yesterday, guess what was waiting for me? Interestingly, it was accompanied by a flat stare from my wife. Wait, I can explain. I ordered this months ago, in fact it was technically last year. That has to be outside of the statue of limitations for tool purchases…right? 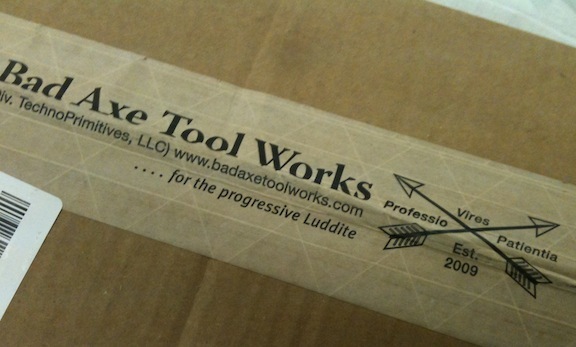 I opened up the package this morning and was very pleased with my new saw. 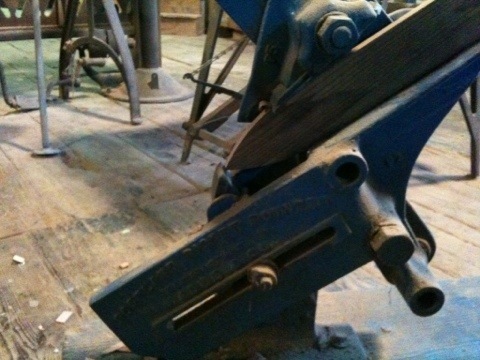 This is his standard tenon saw, with black nickel back, niter blued split nuts and a mesquite handle. It’s beautiful, it starts easily and cuts smooth and true. After unpacking the saw and making exactly one cut I put my overnight bag in the car, picked my son up from school and drove 7 hours up to Eureka, CA for the annual “May Day” event at Blue Ox Mill. They will have woodworking, blacksmithing and other crafts demonstrated, and they have a collection of human powered machines on display. I’m looking forward to a fun weekend, but I can’t wait to get back to put my new saw to work.